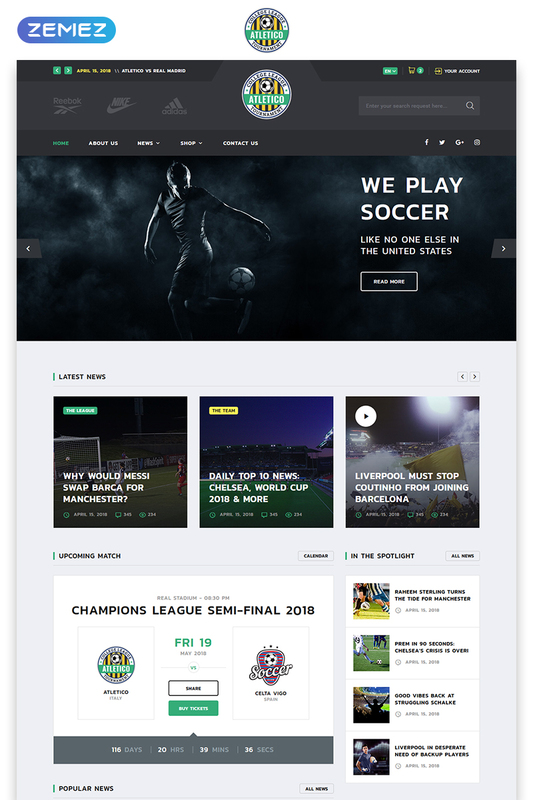 Soccer Multipage HTML5 Website Template is a multipage template for a soccer team website based on HTML5. The magnificent design of the user interface contains various pre-installed color schemes that can give an original and modern look to any website. As this template is developed on the basis of HTML5 and CSS3, it provides full control over all parameters of the page layouts. There’s a choice for the dimensions of all elements, color settings, and much more. And a set of adaptive functions allows the template to work correctly on any mobile platforms. Snooker – Billiard Multipage HTML5 Website Template was created with the idea of bringing you flexible website template. With various innovative technologies that make your work with your future website not only easier but more productive, without unnecessary coding. You can be sure that your website will never let you down. This fully responsive template will help you to create a fully-functional website and start working without holdups. Select among many different customization variants to adjust your template to make it look like you want it to look. This theme can be used for building a professional blog of any kind. It offers quite an interesting design that will make your project look awesome. The template is also well organized, so the visitors will easily find the required information in a blink of an eye. A fully responsive design makes this car rental website template fully adaptive to all screens. In other words it will look and perform equally well on both desktops and smartphones. An assortment of customization features allows you to change the theme in accordance with the specifications of your business. Looking for a quick and hassle-free solution to launch your auto towing, roadside services or car serviceman website? Fully editable Car Towing Website Template is perfect for building a strong online presence. Neatly organized menu makes navigation adorable and every page of your site will be easy to reach. With premade HTML pages and crafted with care elements of this template, you don’t have to worry about the look and functionality of your website. Highlight your works with Cherry services plugin; add all needed information about your business on the dedicated page. Hit the demo to learn more about Car Towing Website Template. Limo is a fully responsive and well documented Transportation Site Template. Its unique features provide benefits for both you and your clients. Thanks to Bootstrap 4, visitors can open your site on any device they have in hand. It will be viewed on tablets and smartphones just as great as on desktops and laptops. The blog will help you get the most user engagement and involve them into company’s story. When opening the site, visitors will be fascinated with the image slider. Use it to highlight your special offers. Google map widget meant to simplify the life of your clients. Carent is a well-documented and fully responsive Car Rental Site Template, produced for car rental services websites. Use this automobile theme for creating a pro site with readable fonts, cool car backgrounds, and low-key tones. Provide your customers with first-class comfort using your automotive website with Stick-To-Top of the page MegaMenu, Car Search on the main page, Social Options, and Contact Form. Showcase your offers and team professionally with services, and team members, and use a wide range of UI elements to add multiple types of content. DanceStudio is your multipurpose solution for the coolest website! This Dance Academy Web Template has 35+ ready-made HTML pages that allow you tell your audience everything about your studio in details. A wide range of UI elements allows you to add all types of content to your future site to capture your customers’ attention. Multiple blog layouts and versatile header & footer styles will help showcase your own style in your site’s design, while an elegant website slider will present the dance studio’s philosophy and dance styles. Speedy Cars is a simple HTML template for cars enthusiastic people, who are interested in making cars related website or blog about cars, vehicles or any other sports vehicle catalog based or blog website. The html package consist of: 3 layouts for homepage; 2 layouts for blog page; 2 layouts for contact us page; 1 gallery page; 1 pricing page with different styles; 1 about us page; additional features includes accordian, tabs, buttons and 404 page; 1 portfolio page with gallery as well; blog layout and blog detail pages; tab page with different styles. This is a simple and fastest loading html template for sports enthusiastic people, who are interested in making a sports related website or blog about bikes, cars, bicycles or any other sports vehicle catalog based or blog website. With different styles and versions of pages. you can choose and decide which layout you want to use. Due to the winning combination of white and blue hues, the layout of this template looks clean and pleasant to the eye. Whether it deals with bikes cars you can easily modify this design to look exactly as you need. It is a feature-rich option packed with tools for communicating with customers contact form, effective content presentation full-width slider and sortable gallery, and many others.